Ukraine's President Viktor Yushchenko has sacked his government in a move that may mark the end of the coalition that won the Orange Revolution. He said in-fighting between members of the team had affected affairs of state. Correspondents say Prime Minister Yulia Tymoshenko and the head of the Security and Defence Council, Petro Poroshenko, were at loggerheads from the start. Mr Poroshenko quit earlier on Thursday, following allegations of corruption against him and other Yushchenko aides. Mr Yushchenko appointed a 57-year-old economist, Yuri Yekhanurov, as prime minister. Deputy Prime Minister Mykola Tomenko also resigned on Thursday, while presidential chief of staff Oleksandr Zinchenko resigned on Saturday. Both said the government was riddled with corruption. The Orange Revolution that brought Mr Yushchenko to power was fuelled partly by popular anger over the corruption of the previous government headed by President Leonid Kuchma. Weeks of mass demonstrations forced a re-run of the elections, which had been widely condemned as rigged. 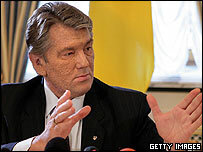 Mr Yushchenko won the final vote and took office in January. A coalition government including ministers from his Our Ukraine party, the Yulia Tymoshenko Bloc and the Socialist Party, was formed the next month. "Separate blocs that emerged within the team began playing their own games behind closed doors, which was rather unpleasant," Mr Yushchenko told journalists. "This involved digging out compromising material, making photos, blackmail and so forth and so on." He added: "Interpersonal conflicts have grown into conflicts between teams and begun affecting state affairs." Ukraine faces parliamentary elections in March 2006, and some observers have speculated that the Yulia Tymoshenko Bloc could run against Our Ukraine, instead of continuing their electoral pact. 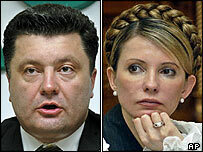 Mr Poroshenko, a member of Our Ukraine, was disappointed when Ms Tymoshenko was appointed prime minister. Mr Poroshenko is a millionaire chocolate tycoon, while Ms Tymoshenko is believed to have made a fortune in the gas distribution sector. Earlier, Mr Tomenko said he did not want to bear responsibility for "those who had created a system of corruption" in Mr Yushchenko's team. "I have realised that some people steal and others resign," he told a news conference. Mr Poroshenko, who has denied allegations of corruption, said he was stepping down so as not to obstruct an official investigation. After the sacking of the government, Ukraine's state security (SBU) chief Oleksander Turchinov, an ally of Ms Tymoshenko, also tendered his resignation. He was replaced by his deputy, Ihor Dryzhchany. Mr Yushchenko has himself come in for strong criticism in recent weeks for trying to block a journalist's investigation into his son's alleged life of luxury. The disarray within the government, including its failure to agree on a list of dubious privatisations carried out by the last government, has caused some popular disillusionment. This has been aggravated by rising inflation and a falling rate of economic growth. Asked what role he envisaged for Ms Tymoshenko and Mr Poroshenko in future, Mr Yushchenko said he still regarded them as friends and wanted them to "stay in the pro-government team". He added: "If they are capable of working together, if they can prove they can change their behaviour, my assessment of these people's role remains unchanged."